Sam and Gertie began to get like syrup. That means Sam and Gertie are getting a little sweet on each other. Sam & I distrubed bills around town for Prof.
Sam & I went skating. Girls went down after dinner. HAVANA, Feb 18 -- "Captain Sigsbee (who survived the explosion) and the local board of investigation rowed today round and round the sunken, twisted masses, all that is left of the splendid battleship Maine. 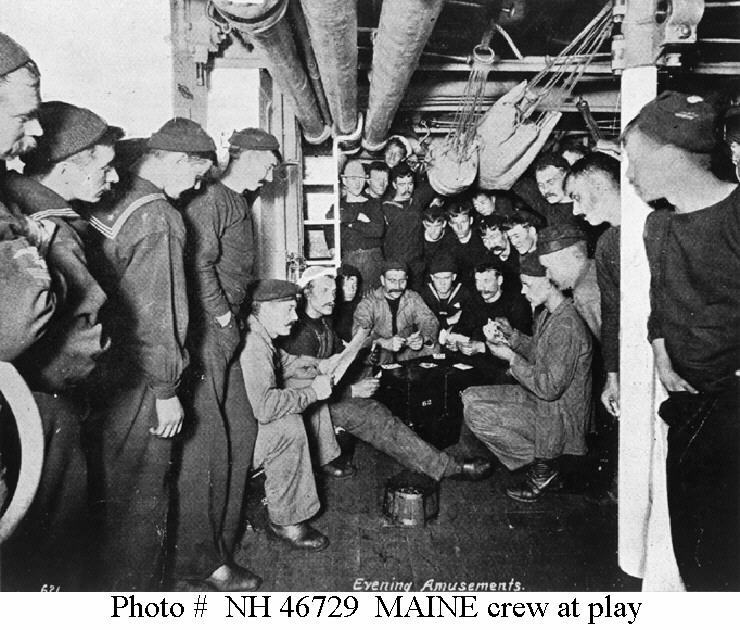 They could not get on board because of the orders of the authorities, at least the guards said so, and Captain Sigsbee obeyed, although his pennant was still flying from the masthead and the parts of the Maine above water (or below it either) were "just as much United States soil" as ever they were. The officers examined the position of the wreck closely. It was noted primarily that the whole force of the explosion was from port to starboard." HAVANA, Feb. 18 - "Consul General Lee has received many dispatches from newspapers in the United States with reference to the Maine disaster, to which the consular regulations prevent him from replying." HAVANA, Feb. 18 - ............"The bodies of the sailors who went down with the Maine are getting into such a condition that they float, and the currents carry them about the harbor. More than fourteen...were found at Casa Blanca, under the walls of Cabanas fortress." The article gives much detailed information regarding the dead. LONDON, Feb. 19.--"The Daily Chronicle has secured from Mr. Gladstone the following message for America: "I am deeply grieved at the sad loss the American people have suffered."" MADRID, Feb. 18 -- "Today the Spanish press shows indignation because doubts are expressed in America as to the origin of the catastrophe to the Maine." WASHINGTON, Feb. 18. -- "A debate, decided in its sensations, was unexpectedly precipitated in the senate today over the consideration of the resolution of Mr. Allen of Nebraska, directing the committee on naval affairs to investigate the disaster to the Maine." The article goes on to state that the Illinois senator "delivered a speech in which he said that the people demanded the truth concerning the explosion, and declared that they would not be satisfied with the investigation to be conducted by the officers of the navy, who would virtually try their own case, and would cover up any blame that the officers might show attached to them." And again, later, the article states, "The sinking of the Maine will be made the subject of immediate and exhaustive inquiry and congress will be fully advised of the result of such investigation." Much debate followed. America will soon be at war with Spain. Today's photo (found online) was obviously taken before the explosion. It seems strange to view this small moment in their lives while they were posing for a photographer and know that some if not all of these very men perished the night of February 15, 1898 when the Maine exploded in Havana Harbor. If you want to see the front page of the Omaha Bee click here. In a strange sort of way the news seems so "current" in its intensity and uproar. I love that expression "get like syrup"! !